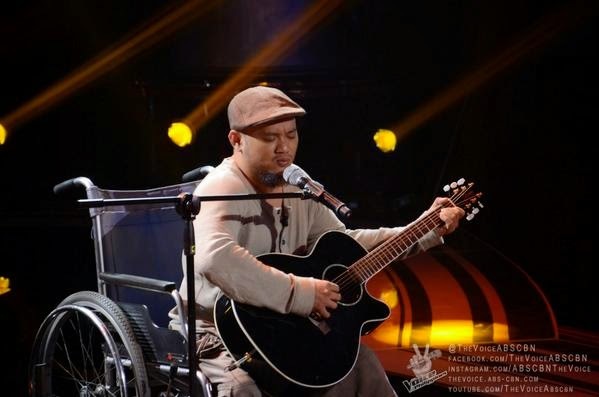 MANILA, Philippines - A person with disability (PWD) Karlo Mojica hits the blind auditions of “The Voice of the Philippines” on Sunday, Nov 2, 2014 to show that nothing can stop him from achieving his dream. Karlo Mojica, 35, from Makati City has proved that Filipinos are not only known for their innate singing talent, but also for their positivity and tireless passion. Mojica sang Freddie Aguilar hit "Bulag, Pipi, Bingi" which captivated the hearts of the judges specially coach Bamboo and Apl.de.ap. The Sunday's episode of 'The Voice of the Philippines' Season 2 dominates online conversations with '#VoicePH2', 'Mark Cando', 'Kai Honasan' and 'Teenage Dream' among the trending topics.